The Bills are a virtual lock to be represented in some fashion at each and every major pro day, and the situation is no different for the Ohio State pro day with a couple of key offensive coaches on hand. Both quarterbacks coach David Lee and offensive coordinator Greg Roman are on hand to watch QB Cardale Jones throw. That’s because Jones did not throw at the NFL Combine last month after suffering a hamstring injury during his 40-yard dash. He was the only QB not to throw in Indianapolis. The knock on Jones is that he doesn’t have good anticipation to throw receivers open, lacks touch on underneath and intermediate passes and has questionable decision making. It’s hard to show he’s improved in those areas when he’s throwing routes on air (no defense), but what will be of interest is how he looks under center and how much he’s cleaned up his footwork with QB guru George Whitfield since the college season ended. Jones is expected to go anywhere between round two and four in the spring and it will largely depend on whether a team falls in love with him and takes him early. If not round four is more likely, as he’s clearly a developmental prospect with great physical tools. The Buckeyes had the most players at the NFL Combine in Indy last month (14) and they may have as many scouts and NFL coaches on hand today in Columbus as any college campus has had for a pro day this year. The college pro day schedule is in full swing and one of the big schools on the docket today was Clemson. Not surprisingly, Bills head coach Rex Ryan was in attendance. Ryan’s son Seth is a holder and reserve receiver on the Tigers squad, so his support for the program is understandable. Here he is on site today with Steelers head coach Mike Tomlin. A couple of the more noteworthy performances were turned in by Clemson CB Mackensie Alexander, who was clocked at 4.41 and 4.48 in the 40. He also had a 37.5-inch vertical leap. DE Kevin Dodd and DL Shaq Lawson were both asked to do linebacker drills. Dodd, who ran a 4.86 at the Combine didn’t do the bench press in Indy. He had 22 reps of 225 Thursday. WR Charone Peake may have lowered his 40 time. He ran a 4.45 at the Combine, but according to reports some scouts had him in the 4.3s Thursday. Oregon and Mississippi State also held their pro days on campus Thursday. The week begins with three pro days on the college circuit including an SEC and a Big 10 school. Auburn, Minnesota and Prairie View A&M all will be holding their college pro days today for their draft prospects. Here are some of the top names who will be in action on their respective campuses. Bills GM Doug Whaley is a scout at his core, so the personnel evaluator naturally gets to as many pro days as possible. So it was not surprising to see his name listed among the front office executives at the University of Miami pro day. NFL Network reporter Lindsay Rhodes reported that Whaley is on hand at Miami’s pro day in Coral Gables today among a host of other GMs and coaches. Spotted at Miami pro day: (HCs) Tomlin, Bowles, S.Payton, Philbin, (GMs) Loomis, Maccagnan, Colbert, Reese, Whaley, Keim, Hickey, Webster. Among the more notable prospects in this year’s draft class from the U are OT Ereck Flowers, TE Clive Walford (who pulled his hamstring and is not running), LB Denzel Perryman, RB Duke Johnson, WR Phillip Dorsett and CB LaDarius Gunter. Here’s a shot of Whaley observing at the Miami pro day from Dolphins beat reporter Omar Kelly. Tennessee QB Tyler Bray put a bow on his pre-draft scheduled with his pro day in Knoxville today. Overall he was relatively satisfied with what he showed on the field. Bray, who is the only junior eligible QB in the draft class, said he did not have a specific script with a specific number of throws Wednesday. Bray said his main focus today was to show consistent footwork from start to finish during his throwing session. The feedback he got from scouts and coaches at the NFL Combine last month was that his feet were not consistent with drops, set up and delivery. Bray weighed in at 230 pounds, 15 pounds heavier than his listed weight during the 2012 college season. Bray says the weight gain has helped him most in putting more velocity on the ball thanks to his improved core strength. Tennessee QB Tyler Bray, the only junior eligible at the position in the draft class, had his pro day today in Knoxville. The night before a 2013 AFC opponent of the Bills had dinner with the Volunteers. According to ESPN’s Adam Schefter the Pittsburgh Steelers took Bray out to dinner. Worth noting: Steelers’ braintrust had dinner with Tennessee QB Tyler Bray before attending his Pro Day. Knowing the Steelers have seen some top talent walk out the door at wide receiver (Mike Wallace) and offensive tackle (Willie Colon) it’s possible Pittsburgh was picking Bray’s brain about his receivers Cordarrelle Patterson and Justin Hunter as well as OL Dallas Thomas. They attended the West Virginia pro day to watch Geno Smith last week, but the Jacksonville Jaguars, holders of the second overall pick are certainly sounding very interested in the Mountaineers signal caller. Jaguars new head coach Gus Bradley, much like Bills GM Buddy Nix and Assistant GM Doug Whaley took in Smith’s pro day last week in Morgantown. “I had high expectations, but I think I came out of there feeling even better,” Bradley told the Florida Times-Union. “I sat down with him and I just wanted to see how he would be once he entered our building. Are people going to gravitate toward him? Is he going to be a leader? Is he going to be a guy everybody backs and will he allow that to happen? The general consensus from the outside is the Jaguars have too many other positional needs to take a quarterback second overall, and they still believe that Blaine Gabbert deserves an opportunity to compete for the starting job after being made a first-round pick two years ago. With Bills GM Buddy Nix and Assistant GM Doug Whaley in attendance at the Arkansas pro day their eyes are likely to be transfixed on QB Tyler Wilson, but there are a couple of other prospects that will merit a second look. One of them is Arkansas TE Chris Gragg, who has had his share of injury problems including a knee injury this past September that compromised his production along with the rest of the Razorbacks offense. But his workout at the NFL Combine last month has unquestionably boosted his draft stock. Gragg (6’2 3/4″ 244) ran the fastest 40 time among the tight end group with an impressive 4.5. No other tight end ran a sub 4.6. He also had the best broad jump at 10’5″ a full half-foot better than Notre Dame’s Tyler Eifert (9’11”). Gragg also put up the highest vertical leap among the tight ends posting a 37.5 inch leap. He had a respectable 18 reps on the bench, the third fastest three-cone drill time among tight ends. The only time that was near the bottom of the tight end group was the shuttle. His durability will still be questioned and likely keep him a day three consideration, but he might be a fifth rounder now instead of a sixth rounder. Gragg is a former receiver, but fits the NFL as an H-back type. Buffalo’s top two personnel men are on the ground in Fayetteville as they’re ready to take in another pro day and get up close and personal with another top quarterback prospect. Buffalobills.com has learned that GM Buddy Nix and Assistant GM Doug Whaley are in attendance at the Arkansas pro day, which most notably features Razorbacks QB Tyler Wilson. Wilson is widely ranked as one of the top five quarterbacks in this year’s draft class. The Bills have spent a good deal of time in the pre-draft process meeting with him both at the Senior Bowl and the NFL Combine. He’s been forecast as a second round draft choice. There are pluses and minuses to working out at the NFL Combine. West Virginia QB prospect Geno Smith experienced those last month, and then the benefits of working out at a pro day. Now with both experiences behind him it’s not contest as to which of them was easier. Weinke, a former NFL quarterback, has been working with Smith as his quarterback coach since the college season ended. NFL prospects are expected to look good at their college pro days. They’re in their comfort zone so NFL scouts are anticipating that they’ll do well. Despite that expectation all accounts of Clemson WR DeAndre Hopkins pro day were still extremely positive. NFL Draft Insider filed this brief report on the playmaking Clemson wideout from his Thursday pro day. DeAndre Hopkins/WR: Was timed as fast as the low 4.4’s on a number of watches but was later given an “official” time of 4.52. Except for two drops late in the session his pass catching workout was described as “dazzling”. Hopkins, who has been compared to Reggie Wayne, has been a model of production at Clemson and in 2012 logged 82 catches for 1,405 yards and a school-record 18 touchdowns, good for second-most in the country. He’s forecast as a late first or early second-round pick. There’s also a sleeper WR out of Clemson by the name of Jaron Brow, who has the physical skill set to play at the pro level. Here was NFL Draft Insider’s brief report on his day. 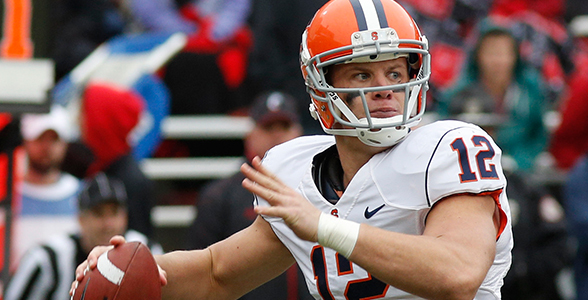 Ryan Nassib only did throwing drills at the Syracuse pro day today, but by most accounts did very well. Here’s one report from NFLDraftInsider Tony Pauline, who also is reporting that a Bills division rival will be dining with Nassib tonight. According to Pauline, New York Jets offensive coordinator Marty Mornhinweg will be dining with Nassib this evening. Ryan Nassib/QB/Syracuse impressiveproday. 75 passes and 4hit the carpet, 3due to WR drops. Significantly improved his deep accuracy. Ryan Nassib will be dining/meeting with Marty Mornhinweg and the New York Jets tonight. Bills GM Buddy Nix has talked openly about how much he’s seen of the quarterbacks in the draft pool in person. Nix continued in that effort Thursday as he made the drive down the Thruway to watch QB Ryan Nassib at Syracuse pro day. That according to Syracuse.com’s Brent Axe. He also reported that Nix is reportedly trying to set up a private workout for Nassib with the Bills in early April. Nassib only threw at Syracuse pro day today, choosing to stand on his Combine numbers. Buffalo Bills GM Buddy Nix was at SU pro day. Im told Nix is going to try and come back for a private workout with Ryan Nassib in early April. April 6 is target date. My colleague @michael_cohen13 has written about this, but Ryan Nassib is in terrific shape. Looks a lot bigger even from end of the season. All Nassib did was throw today. 29 NFL teams were in attendance, including as mentioned earlier, Bills GM Buddy Nix. Syracuse will conduct their pro day today for their draft prospects. Obviously QB Ryan Nassib will be the headliner, but there are a few other draft worthy prospects working out in the Salt City today. Nassib along with OT Justin Pugh, WR Alec Lemon and S Shamarko Thomas are all expected to participate to some degree along with the other graduating players for the Orange. Nassib will likely be looking to improve on his 40 time at the Combine, which was a pedestrian 5.06, the second slowest among QBs that ran in Indy. He’s also likely to want to improve his broad jump, which in Indy was 8’9″. He didn’t bench at the Combine (most QBs do not) and probably won’t today. For Pugh he may also want to improve on some numbers he put up at the Combine. He did not bench at the Combine so barring an injury he’s expected to bench at today’s pro day. Lemon needs to improve on his Combine numbers today after a 40 time of 4.59 and just seven reps on the bench. The only Combine participant from Syracuse that’s likely to stick with most of his numbers is S Shamarko Thomas, who had a great workout in Indy. He ran a 4.42 40 time, which was the fastest among the safety group. He had the best vertical among the safeties at 40.5 inches, the most reps on the bench by far with an impressive 28 and had the second-longest broad jump at 11’2″. Purdue DT Kawann Short was unable to work out at the school’s pro day after missing the NFL Combine workout as well. Short is still dealing with a hamstring injury that kept him from participating at the Combine in Indianapolis. He has a personal pro day scheduled for March 25th, a day before the pro day at Notre Dame. Short is projected as a late first-round pick. NFL.com’s Gil Brandt reports that DB Michael Johnson ran the 40 in 4.58 and 4.55 seconds, which improved on his 4.65 time at the combine, had a 36-inch vertical and a 9-11 broad jump. Johnson by Brandt’s account looked good in the positional workouts. The South Carolina pro day was the highlight on the college pro day schedule Wednesday. With names like Melvin Ingram, Alshon Jeffery and Stephon Gilmore most of the league was in attendance. SI.com’s draft analyst Tony Pauline filed this report on the Gamecocks pro day with Ingram serving as a big headliner after another eye-popping performance not unlike his work at the NFL Combine last month. He didn’t tear up the track in the 40, but at 6’3″ 213 pounds, South Carolina WR Alshon Jeffery just needed to be respectable in the 40 and pretty good at everything else at his pro day Wednesday. Mission accomplished. According to Gamecocksonline.com Jeffery had a 10’2″ broad jump and 35.5-inch vertical leap. As for his 40 times they were in an acceptable range for a player his size albeit not elite. Update: there are additional reports that Jeffery stumbled out of his stance on 2nd 40, which might explain the slower time from the first attempt. Either way Jeffery is widely considered one of the top 5 wideouts in this year’s draft class and could go as early as late round one in late April. Several NFL prospects at South Carolina are being put through the paces at the Gamecocks pro day in Columbia including WR Alshon Jeffery, who did not work out at the NFL Combine. DL Melvin Ingram and CB Stephon Gilmore along with Jeffery are among those headlining the prospects participating. Here’s an update on Jeffery. No 40 time yet on Jeffery, but we’ll pass it along when it’s available. Jeffery lost three pounds having weighed 216 at the NFL Combine last month. South Dakota St. WR Dale Moss only has one year of college tape on the football field for scouts, but he’s definitely shown he’s got the physical talent after his pro day workout Thursday. Moss clocked a 4.45 in the 40, had a vertical leap of 41.5 inches, a broad jump of 10 feet, 10 inches and a time of 6.32 in the three cone drill that would’ve been the best among WRs at the NFL Combine last month. At 6’3″ and 213 pounds, Moss logged 61 receptions for 949 yards and six touchdowns in his only season of college football after playing on South Dakota State’s basketball team. The Bills already have a South Dakota State product on their roster in Danny Batten, who was a sixth-round pick in 2010. Moss is forecast as a late round selection as well. Stanford OT Jonathan Martin had his pro day in the shadow of the Andrew Luck circus at Palo Alto. Here’s how he fared. Martin, who did not work out at the Combine due to food poisoning, had 20 reps on the bench press and ran a 5.33 and a 5.43 on his two 40-yard runs. He had a 30-inch vertical leap and a broad jump of 8’8″. In comparison to those offensive tackles that did work out at the NFL Combine last month, here’s how his numbers would have matched up. Some NFL talent evaluators wonder if he’s cut out to be a left tackle in the NFL, thinking he might project better to the right side. Martin when interviewed after his pro day workout said he wants to remain a left tackle, a position he played at Stanford for each of the last three seasons. He also told the San Jose Mercury News that he has pre-draft visits scheduled with the Bills, Vikings and Browns. Minnesota picks third, Cleveland fourth and 22nd in round one of the 2012 NFL draft. The Stanford product is widely considered one of the top three tackles prospects in the draft class.